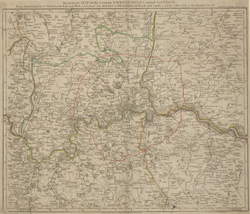 Map scale description: 1/4'' : 1 m.
In the second half of the 18th century, the introduction of turnpike roads and the increased coach-traffic in and out of London contributed to the popularity of the maps of the countryside around the capital. The title of this plan runs along the top, with borders divided in degrees of latitude and longitude, county boundaries outlined in colour and the circuit of the Penny Post marked in red. Before William Dockwra set up the Penny Post in 1680, there was no local delivery of letters in London, except by private courier. Dockwra opened seven sorting offices and hundreds of receiving houses. Letters were delivered to addresses in London for the charge of a penny, paid by the sender. An extra penny was charged for deliveries in the London Country area within ten miles of the city. In 1682, the Post Office took over the running of the service.